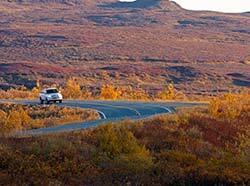 Denali Highway is paved for several miles out of Paxson. 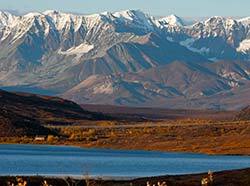 Enjoy views of the Alaska Range from the road. This sparsely-traveled, mostly gravel highway offers a taste of wild Alaska and wide-open vistas of mountains, glaciers, tundra, forests, lakes, and rivers. The 133-mile road connects Paxson Lodge on the Richardson Highway with the Cantwell junction on the Parks Highway. Only the first 21 miles west of the Richardson Highway and 3 miles east of Cantwell Junction is paved. The road climbs to elevations over 4000 feet offering birders relatively easy access to alpine habitats. Posted trailheads on the eastern portion of the road mark good starting points for off-road travel and wildlife viewing. Several canoe routes are also accessible from the highway. Tangle Lakes at the headwaters of the Delta River is a popular launching area for canoeists. Most of the land along the highway is publicly owned. The federal Bureau of Land Management (BLM) maintains some trails and camping facilities along the way. The highway is generally open from mid-May to October 1. Do not take a vehicle on the road outside of these dates as snowdrifts can block your way and leave you stranded. Carry extra food, water, and camping equipment as well as a spare tire and jack while driving on this road. Be prepared as help may not be readily available. Visitors may see caribou, grizzly bear, and red fox combing the tundra for food while gyrfalcons and long-tailed jaegers circle overhead. Raptors are especially plentiful in years when the snowshoe hare populations are high. In autumn, large numbers of migrating caribou may be visible from the Richardson and Denali Highways. Viewing is particularly good when the hunting season is closed between late September and mid-October. Migrating caribou can also be observed in September and early October from the Upper Delta River south along the Richardson Highway through the Paxson Lake area. Moose, black bears, northern hawk owls, and spruce grouse live in the forests. The many lakes, ponds, and streams near the road also provide glimpses of beavers, muskrats, moose, and a variety of birds, including trumpeter swans, loons, long-tailed ducks, Arctic terns, and red-necked phalaropes. A large run of sockeye salmon in the Gulkana River offers easy viewing opportunities in August and September. The BLM has two main campgrounds along the highway, one at Tangle Lakes to the east at Milepost 21.5 and one at Brushkana Creek to the west at Milepost 104. After an overhaul of the Tangle Lakes facilities in 2013, all 46 campsites, restrooms and most trails have been designed to meet accessibility standards. Check with the BLM for the “most accessible” areas, which provide the best campsites and trails for persons with disabilities. The Brushkana facility has two accessible campsites out of a total of 22 sites. The eastern end of the Denali Highway joins the Richardson Highway at Paxson (260 highway miles north of Anchorage; 179 miles south of Fairbanks). Cantwell, at the western end of the Denali, lies on the Parks Highway 210 miles from Anchorage and 148 miles from Fairbanks. The BLM also offers a guidebook to the Denali Highway with a milepost-by-milepost explanation of the spectacular features you will see traveling the Denali Highway between Paxson and Cantwell. Check with the BLM on price and availability.